The first 3 months for R9. From the 4th month R207 for 3 months. The all-new SOUND FORGE Audio Studio is the audio editor for everything and everyone. Whether you need to record, edit, restore or master your audio, it is the perfect tool with a host of professional features and effects. Record pristine audio, restore and digitize your records and tapes, create podcasts and video soundtracks, prepare CDs for duplication or master music for broadcast and streaming. SOUND FORGE Audio Studio does it all, with ease. 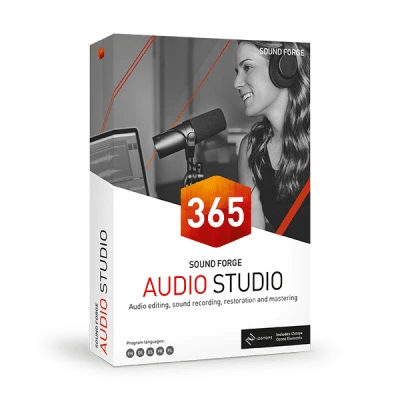 SOUND FORGE Audio Studio 365 is the low-cost subscription option for great all-round audio editing. It has all the features from SOUND FORGE Audio Studio, but now you also get all the updates, patches, upgrades and new features as they are released. SOUND FORGE Audio Studio 365 – a low monthly cost and always up to date. Yes, the software can be used offline for the duration of your subscription. An internet connection is only required to check for new software updates as well as to validate the program once a month. Even if you end or suspend your subscription, your projects are yours to keep forever. That means if you need to work on your project after your subscription has expired, you can renew your subscription and open the project again to continue editing. You will also be able to open the project created in SOUND FORGE Audio Studio 365 in your perpetual version as long as your perpetual version is equal to or later than the version it was created in (for example, if you created the project in SOUND FORGE Audio Studio 365 version 13, then you can open it with regular SOUND FORGE Audio Studio version 13 or later). If you end or pause your subscription to SOUND FORGE Audio Studio 365 and switch to a perpetual version, your projects are yours to keep whatever you decide to do next. You will be able to open projects created in SOUND FORGE Audio Studio 365 in a perpetual version as long as it is equal to or later than the version it was created in (for example, if you created the project in SOUND FORGE Audio Studio 365 you will be able to open it in a regular SOUND FORGE Audio Studio version 13 or later). All plug-ins will be available during the duration of the subscription. With every new version of SOUND FORGE Audio Studio, the latest version of the plug-ins are included. Will I lose any version of SOUND FORGE Audio Studio I already have installed? No. You can use other installed versions in parallel with SOUND FORGE Audio Studio 365.